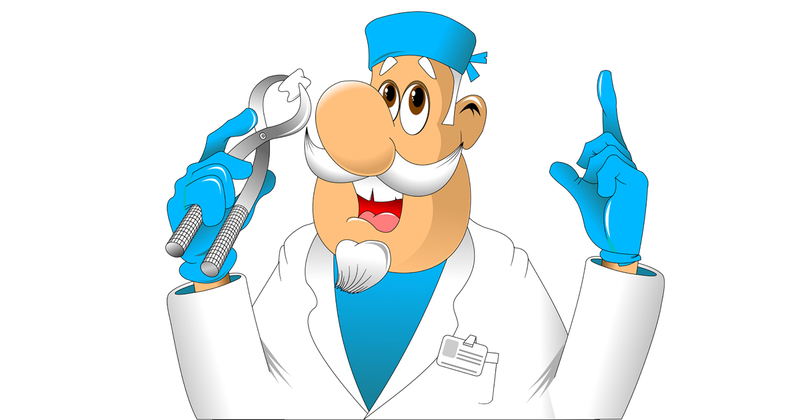 Expert tooth extractions by our Northern New Jersey surgeons. Having a tooth pulled may not be pleasant, but it’s often necessary–either to make way for a permanent tooth, or when a tooth becomes infected, decayed, or otherwise jeopardizes your health. Our Northern New Jersey Garden State Dental dsurgeonentists provide affordable and professional extraction services to ensure you get appropriate care before, during, and after a tooth extraction procedure. In most cases, a tooth extraction results in only mild pain. If you’re concerned about sensitivity, ask your Garden State Dental surgeon about a local anesthetic to numb the area. If you need more than one tooth removed, or if the tooth is in a particularly sensitive area of the mouth, your surgeon may suggest a general anesthetic so that you sleep throughout the extraction procedure. First, your surgeon will numb the gum with a local anesthetic. Once you’re comfortable, the surgeon will gently loosen the tooth by rocking it back and forth. After the tooth becomes sufficiently loosened from the gum, the surgeon will extract it, placing gauze over the socket to prevent excess bleeding. You may be asked to bite down on the gauze, holding it in place while a clot forms. If your tooth is removed for reasons other than to make way for a permanent tooth, your surgeon may recommend a replacement. Otherwise, the teeth surrounding the now empty space may shift and lead to potential problems. There are many different replacement methods available. Your surgeon will discuss your options and recommend the best one based on your needs. It may be necessary to wait until your mouth has completely healed before having your tooth replaced. Wisdom teeth are the third molars in the back of your mouth that grow in around adulthood—yet rarely without pain or other problems. While many people never develop wisdom teeth at all, those who do frequently require their extraction. Sometimes, the teeth are misaligned or don’t have the necessary space to develop properly. When this happens, they will need to be removed to avoid further complications. How a wisdom tooth is removed. Most wisdom tooth removals are fairly routine procedures, performed in an outpatient setting under local or general anesthesia. If your surgeon decides your wisdom teeth require removal, he or she will discuss your particular procedure beforehand. Please let your surgeon know if you have any special concerns, allergies, medical conditions, or pain sensitivities. Reasons for wisdom tooth removal. If your Garden State Dental surgeon recommends extraction, it may be due to a tooth’s poor alignment or the pain you’ve experienced during its development. Occasionally, a wisdom tooth that’s unable to break through the gum becomes impacted. Or, the space in your mouth may simply be too small for the new tooth. It’s best to follow your surgeon’s advice. Otherwise, the wisdom tooth may become infected and develop a painful cyst. Coping with wisdom tooth pain. Although it’s usually best to have a problem wisdom tooth pulled promptly in order to avoid further pain and complications, sometimes an infection needs to be treated first. If required to wait, you can take steps in the interim to reduce pain, swelling, and discomfort. Home remedies, such as rinsing with warm, salty water, can provide temporary pain relief. Applying ice to the outside jaw area for short intervals may also help, as will over-the-counter pain relievers. When is it safe to keep wisdom teeth? Trust your surgeon’s advice on whether or not to keep your wisdom teeth. If extraction is recommended, it may be because a wisdom tooth has the potential to cause excessive pain or more serious problems that could impact good oral and general health. When wisdom teeth don’t develop properly, damage and disease can result. Don’t risk your health or your existing, healthy teeth for these nonessential third molars. Everyone has wisdom teeth, but not everyone knows what they are. Discover more about these teeth and why they have people talking. Dr litman and everyone at garden State dental are awesome people. Highly recommend!! This place is so friendly and peaceful. Everyone from the front desk to the dental hygienist to the dentist were very informative and professional. I am very glad I chose Garden StateDental as my dentist. Everything was done very professionally I am very happy!